There are many reasons to have your car tinted. Some will buy window tint for looks and style and others for heat rejection (protection). But not every window film out on the market is the same. We encourage all of our clients to research all the films available, and make their decision based on what best fits their window tinting needs. We carry many different types of Window Films. All films serve a different purpose. We provide a wide variety of films, to fit your needs and wants. After being in the business for more than 30 years, we have tested and used many different products. For which we have come to the conclusion that we carry the absolute best films available on the market. For Auto Tinting West Palm Beach, Griffin Auto Care, Inc. is a Full Service Collision Repair Body Shop. At Griffin Auto Care, Inc., we take pride in being voted the Best Auto Body Repair company in town! We invite you to connect with us today to see how we can help with your auto body needs. At Griffin Auto and Collision, are driven to provide the very best in Vehicle Collision Repair and Auto Body Repair in West Palm! Located downtown West Palm Beach, centrally located and just a minute east of I-95 and Okeechobee Blve; our experienced and skilled specialists are dedicated to restoring your car or truck to pre-loss condition. 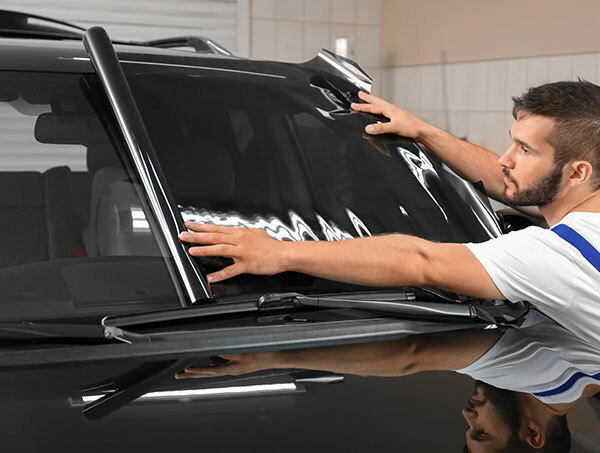 WEST PALM BEACH AUTO TINTING – AUTO BODY PERFECTED BY GRIFFIN AUTO CARE, INC.
To ensure that your vehicle gets the proper treatment deserved. Treating your vehicle as if it were our own is a top priority. In order to back up these claims, we are certified and insured by high insurance policies. Griffin Auto Care, Inc., being recognized as the go to auto tint company in West Palm Beach, we strive on always providing quality with every installation, no matter what vehicle, we always push ourselves to be better and better, to keep your vehicle looking good, and staying fresh! Customer relationship, we hope to build an amazing relationship with our clients, by always providing a smile, high up beat energy, and appreciation towards our clientele. Our goal has and always will be, to be the absolute best. We can’t help but want to give our clients our very best, because you deserve it. To provide the most innovated films on the market, with a professional installation. Our prices may not always be the lowest, but we have always ensured that our clients get quality films, and products. The experience at Griffin Auto Care, Inc. should always leave you with a smile on your face, and that is a top priority for us. Griffin Auto Care, Inc. Window Tint : Strives on providing our customers the best possible experience, when choosing window films for your vehicle. All of our locations are equipped with first class comfort, beverages, and cozy waiting rooms. Our two locations are all conveniently located near Restaurants, Coffee Shops, and or Shopping centers. If a ride is needed, we can arrange a ride for you, upon request, please orchestrate accordingly with the store manager. We understand it is very difficult to choose a window tint company to service your vehicle. But rest assure that the experience that Griffin Auto Care, Inc. provides, will have you coming back over and over again. Our goal is to make this difficult decision easy, efficient, and provide quality installation. We are the #1 go to Window Tint Company in Palm Beach County Florida, with 2 Locations conveniently located. We strive daily to meet the demands of our clients. Customer Service sits at the top of our list, a long with carrying the latest innovated films, to best protect your vehicle. We hope to earn your business not just this one time, but for many years to come. WINDOW FILM IS THE MOST EFFICIENT WAY TO REDUCE UNWANTED SOLAR HEAT TRANSFERRING THROUGH YOUR WINDOWS. IT CAN PROVIDE UP TO 81% SOLAR HEAT REJECTION VERSUS UNTREATED GLASS, WHILE CONTROLLING HOT SPOTS AND COOLING OFF SUN-DRENCHED AREAS IN YOUR HOME OR OFFICE..
WHATEVER THE CAUSE (DIRECT SUN, REFLECTIONS FROM SNOW, WATER, OR SURROUNDING BUILDINGS) THERE IS A PERFECT WINDOW FILM SOLUTION TO HELP REDUCE ANNOYING GLARE.. WINDOW FILM BLOCKS UP TO 99%* OF UV RAYS, WHILE ALSO SIGNIFICANTLY REDUCING HEAT. THIS HELPS TO PROTECT YOUR VALUABLE FURNISHINGS FROM FADING AND PROVIDES A “SUNSCREEN”FOR YOUR SKIN AGAINST THE HARMFUL EFFECTS OF THE SUN. *OUR CLEAR SAFETY AND SECURITY FILMS BLOCK 98% OR MORE OF UV RAYS.. ACCIDENTS, ENVIRONMENTAL EFFECTS AND VANDALISM CAN INSTANTLY TURN A PANE OF GLASS INTO LIFE-THREATENING SHARDS. WINDOW FILM CAN ACT AS A “SAFETY NET” BY HOLDING SHATTERED GLASS TOGETHER..
REDUCING TEMPERATURE IMBALANCES CAUSED BY EXTREME SUNLIGHT IS WHY SO MANY DESIGNERS, ARCHITECTS AND BUILDING ENGINEERS DESIRE WINDOW FILM. REDUCING HEAT LOSS WILL INCREASE HVAC EFFICIENCY AND LOWER ENERGY COSTS.. WHETHER IT’S A CONTEMPORARY LOOK OR A UNIFORM DESIGN, THERE’S A CHOICE OF WINDOW FILM PRODUCTS THAT CAN AESTHETICALLY COMPLIMENT THE EXTERIOR OF A HOME OR OFFICE BUILDING..
IT’S FAST AND HASSLE FREE!